Welsh castles are the undisputed jewel of the country’s tourism industry. Indeed, with more than 400 castles in a recognisable state of repair, Wales can boast the greatest density of castles of any country in the world. Essentially, the strength and ferocity of the mighty fortresses of North Wales – which include Harlech, Beaumaris and Caernarfon – can be attributed to the vision and ruthlessness of one man: Edward I of England. In the late 1200s, in order to secure his control of Wales, he formed an ‘iron ring’ of castles encircling Gwynedd, North Wales. These formidable castles are internationally renowned, and are protected by UNESCO as World Heritage Sites. Harlech Castle is almost the archetypal castle – a magnificent citadel, with four perfectly round towers at each corner. The castle is a member of Edward I’s ‘Iron Ring’ of fortresses, and it perches on a steep rocky ledge, its back to the peaks of Snowdonia in North Wales. 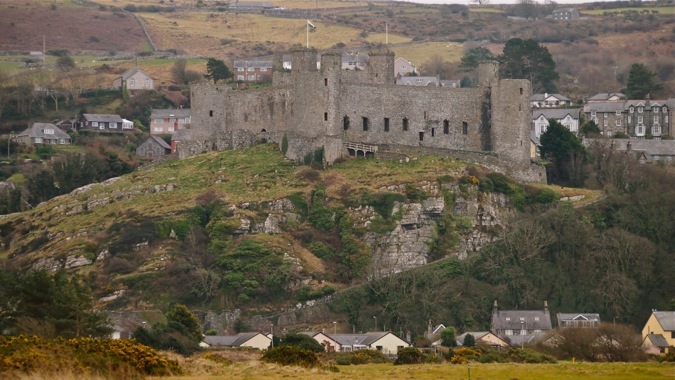 Harlech was an impressive strong-hold, encircled by two thick, stone curtain walls. It also employed an ingenious method to stick-out any siege – as the castle backs onto the ocean, food and supplies could be brought by ship if under attack. Discover more about Harlech Castle. . . There are few castle settings quite as magnificent as Carreg Cennen. You can uncover it on the edges of the Brecon Beacons in west Wales. What’s so incredible is that the castle is perched on a rocky cliff. There’s literally a 100m sheer drop on the south side of the castle. Something that’ll capture anyone’s imagination is that there’s a deep, thin cave hidden in the bedrock beneath the castle. Take a torch if you want to explore. . . Discover more about Carreg Cennen. . .
Dolwyddelan stands lonely and isolated in the middle of the Snowdonia National Park. 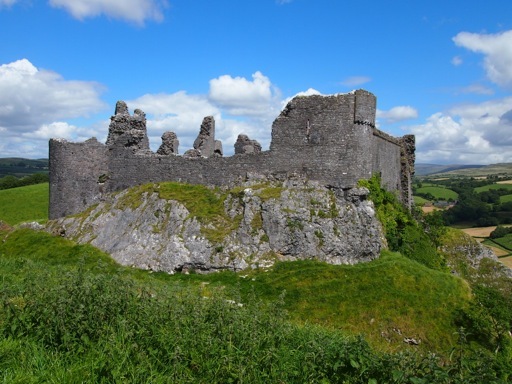 It’s an extremely special castle as it was originally created by the Welsh Princes – rather than the conquering English. It’s a small spot, but the tremendous views of the rugged hills and mountains of Snowdonia make it a truly evocative little castle. Discover more about Dolwyddelan. . .
Raglan Castle is an impressive ruin, that you’ll uncover near Abergavenny, South Wales. The castle was built in three different stages – evolving from one defensive tower into an incredibly grand Tudor manor-house. Despite Raglan’s past grandeur, the castle was destroyed in the aftermath of the English Civil War – leaving the impressive, evocative ruins which can be explored today. 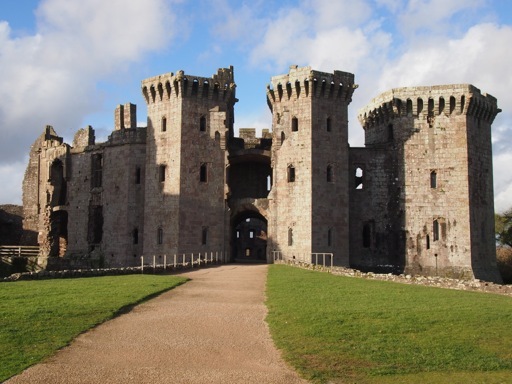 Explore the ruins of Raglan Castle. 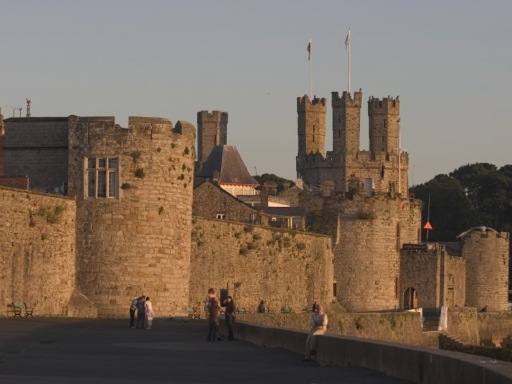 . .
Caernarfon Castle is another ‘big name’ of Edward I’s castle-building campaign. Parts of Caernarfon town huddle, partly protected, behind the castle’s vast, stone, curtain walls. The castle itself is absolutely huge, and shaped in a figure of eight around two sizeable courtyards. Oddly enough, though, the innards of the castle were never really completed – and only the foundations for many grand rooms lie behind the thick walls. The castle is still important in Modern British tradition – it’s the ceremonial spot where the Prince of Wales is ‘crowned’. 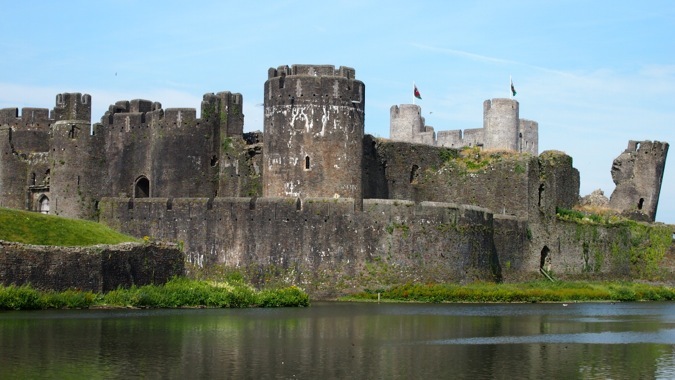 Caerphilly Castle is huge – the second largest in the British Isles, in fact. It was also built at a staggering speed – the place was completed in less than three years. You’d struggle today to achieve that – let alone 700 years ago. It contains a dramatically leaning tower – dubbed the ‘Welsh Tower of Pisa’, alongside many other grand fortifications. Discover the might of Caerphilly Castle. . . This aerial photo gives away exactly what’s so special about Beaumaris Castle. 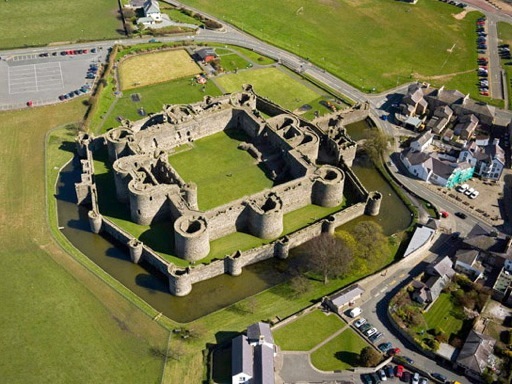 Beaumaris is a perfectly-symmetrical, concentric castle which was designed to be almost impregnable to enemy attack. It was another of Edward I’s ‘iron ring’ of castles. Curiously, the castle was never finished, and what you can see today is an evocative blueprint of what could have been. Uncover what makes Beaumaris so special. 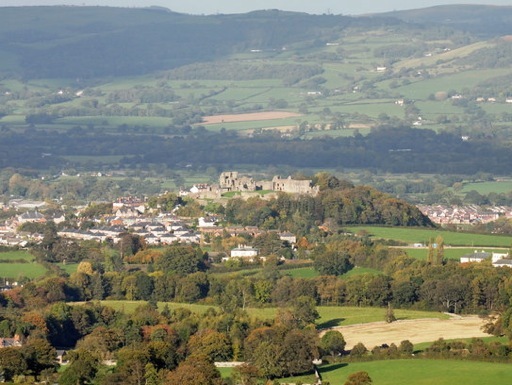 . .
There’s something alluring about old ruins, and the magic of Denbigh Castle stands apart from other spots in Wales. This castle was also built during Edward I’s time, but it’s nowadays reduced to rubble. From the remaining walls and decaying gates, you can more-or-less make out some of the features of this once impressive site. However, a sad mystery hangs around Denbigh, and it’s this which stands it apart from the other castles. As a result, it’s well worth discovering. Discover the secrets of Denbigh. . . In 1066, the arrival of William the Conqueror in England changed British history forever. After killing King Harold, the Norman invasion spread steadily through England and, as it did so, the invaders built castles across the countryside. 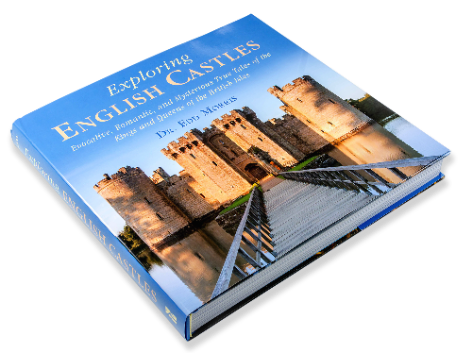 Castles were a particularly Norman innovation – they hadn’t been seen before in England – and the Normans used them as strongholds to keep control of the newly-captured country. Previously, Wales had co-existed alongside England – two warring neighbours. It hadn’t been a peaceful co-existence, as the border had been a site of bitter squabbles over land. But now it became a frontier of defence against the Normans. The Normans were tenacious fighters, keen to acquire more land. It took time, but, in 1093, they succeeded in conquering Wales. And so – of course – they started building Welsh castles to shore up their new power. The age of Welsh castles then began – and on average, one new castle was built per year for the next 200 years! Although the Normans had taken control of the majority of Wales these things weren’t plain sailing. During Medieval times, haphazard communications – and lives lived on a very local level – meant that many towns were captured, then recaptured, and then captured again in a constant struggle between the Norman-sympathizing Barons and Welsh nationalists. The fairytale design of Castell Coch – which means ‘red castle’ – makes it a picturesque afternoon’s outing from Cardiff, Wales. Gwynedd, in North Wales, became a stronghold of resistance against the Norman crown, and home to a series of charismatic leaders who defended their Welsh kingdoms. Over time, these leaders steadily advance to recapture more and more of Wales from the English forces (as the Norman forces had become entwined in the English Royal family). In 1267, a weakened Henry III, who was King of England, signed the Treaty of Montgomery. Its purpose? The treaty recognised that Wales was too powerful to fall entirely under the jurisdiction of the English crown. As a result, the treaty recognised Llywellyn ap Gruffydd to be Prince of Wales. The autonomy of Wales, however, was to be short-lived. 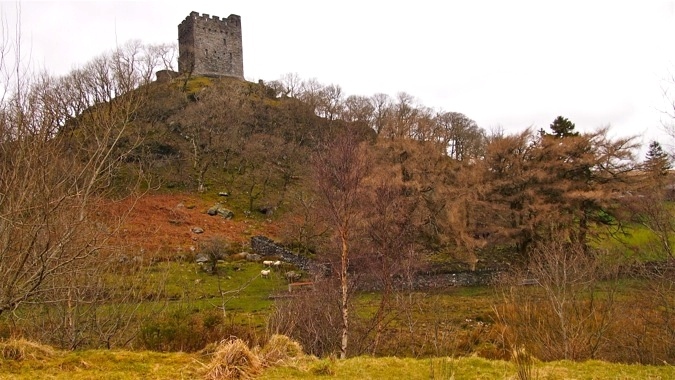 Dolwyddelan Castle looms ominously from a hilltop in Snowdonia, North Wales. It was a stone castle, uniquely built by the Welsh people, rather than Edward I, in the 1200s. On inheriting the English crown, Henry III’s son, Edward I, was much less inclined to negotiate with Wales. After a series of scuffles, he lured Llywellyn into a trap and killed him. He hung, drew and quartered his brother to prevent any claims of succession. And then he consolidated an iron grip upon Wales, building the ‘iron ring’ of Welsh castles that include Beaumaris, Caernarfon, Harlech and Conway, amongst many more. Edward I was a pretty threatening guy – in looks as well as attitude. Being more than 6ft tall, he would have towered over most people in Britain at that time, earning his nickname ‘longshanks’. However, his Welsh castle building project showed that he ruled with an iron fist. Building his ‘iron ring’ of castles would have been the most ambitious construction project in European history. I’ve written a biography of Edward I of England, if you’re interested in discovering more. . .
Edward I built some of the most magnificent Welsh castles, still visible today. And, by building them, he secured his power over the Welsh people – bringing the countries of Wales and England closer together. The relationship was antagonistic and strained for hundreds of years, until the Tudors (who had Welsh blood) came to the English throne. Then, formally, in 1535, England and Wales were joined in union – which continues to today.